Donn Bennett is best known for using repurposed materials, sculpting compounds, and resin to bring a vibrant, 3 dimensional aspect to his paintings. 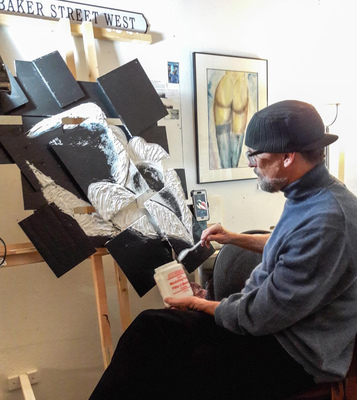 Self-taught, Donn’s interest in figurative art began at an early age learning from his artistic mother; a single woman raising him in Seattle in the 1960s. Her strength and struggles have been a theme throughout his early work. Now, in the wake of the revitalized discussion of women and their role in 21st century culture, Donn is artistically investigating how women are viewed, and view themselves, in the post #METOO world.